Hand Crafted Santoku Knife, Sakura Handle, Japan, 14.5"
This knife is made entirely by hand by master craftsmen in Japan, starting at the hot forge where various elements are blended together to form extremely strong steel that holds a sharp edge for months of constant use. You can also see this knife in action in our Fish Cleaning Video filmed in Tokyo. The main difference in these knives is that they stay extremely sharp after months of constant use. This is due to the hard steel blends, which are simply too hard for machines to cut and sharpen. Machine-made knives are always created from slightly softer steel, which allows them to be cut and sharpened without a human touch. Our handmade knives of Japan are so hard that hand shaping and sharpening is the only way to reach perfection. Why not own a knife like this in your kitchen? It really doesn't get any better. Using knives this sharp enhances not just your experience in the kitchen but also the food, because slicing with an inferior knife tears into and rips fibers. A sharp blade keeps flavors sealed in. You're also supporting the remaining hand crafted knife makers in Japan, reported to be dwinding to just a few hundred, as fewer young people are coming into the trade. Our santoku knife shown here is made by hand in the same factory as shown in our video series. We personally visited and met the lead sharpener who has trained with the master for four years. Hand crafted by master knife makers and sold to you at a very reasonable price, as we purchased directly from the maker. Similar knives are sold in Tokyo shops and abroad for much higher prices. 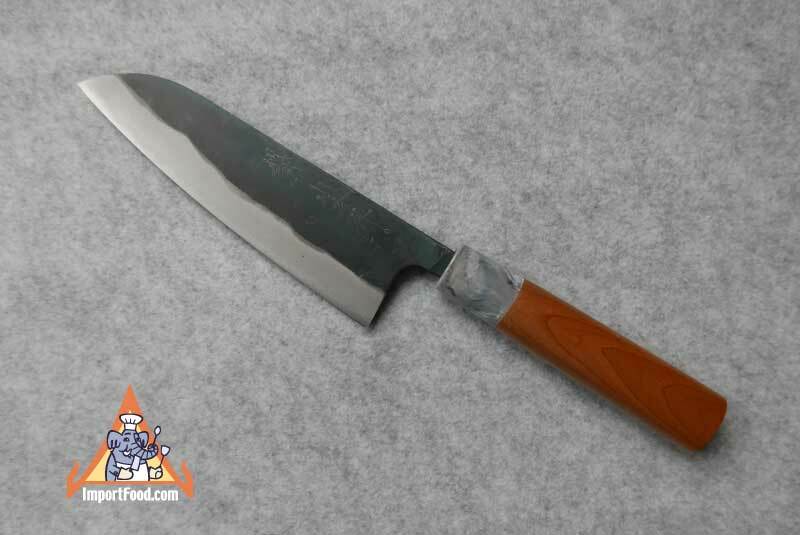 The knife is made of hard carbon steel, sharpened on both sides. The handle is Japanese Sakura (cherry) wood. As you can see, there is a hard plastic band on the handle with a marble pattern. The blade is 8.5" long, and handle is 6" long. Total length 14.5". The blade is identical to the same knife we offer with a magnolia wood handle. Each unique knife is totally made by hand and we only have a few of these. Hand crafted steel has enormous benefits as described, but they also rust if not properly dried after use. To prevent rust, always dry your knife, and you can wipe lightly with olive oil. Here is some of what I use. They are in a knife holder I made, screwed to the kitchen wall under a rack for my French copper pots and pans. Sabatier, Global, Messermeister Elite, Wustof, Forschner, Mac Pro. Others. All razor sharp. My grandfathers and an uncle were butchers. I am a journalist, but also a butcher. Boned out more deer and elk than I can count. I was a wrangler in the most remote hunting camp in the continental U.S. Just of the southeast corner of Yellowstone National Park. One season I had a hand in breaking down 33 elk and three moose with a knife my boss and outfitter made for me. Extremely sharp and held an edge. Great as all my knives are, they seem almost dull compared to the Japanese knife I got from you. Scary sharp. I want more for my kids. 6. Acid solutions, salt and water are a threat to your knife. Always wash them away and keep your knife dry by wiping with a soft cloth to prevent rust.